Home Gadgets Philips Scene Switch 2-in 1 LED Bulb Launched, Priced at Php399! 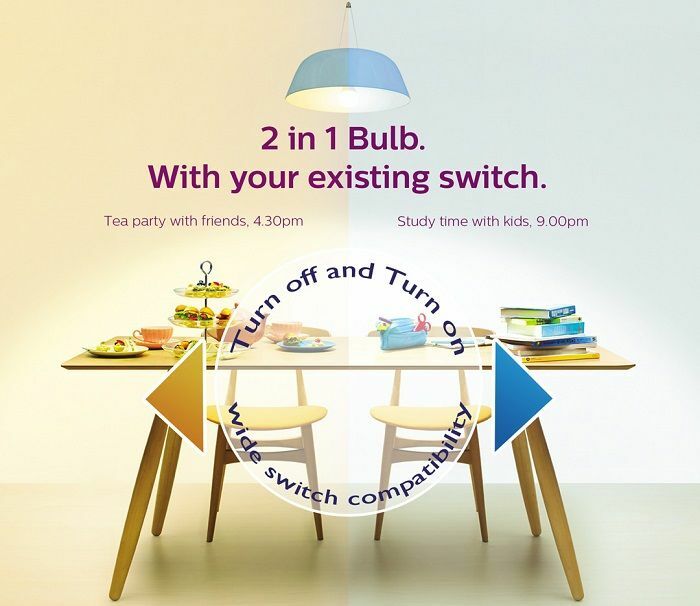 Philips Scene Switch 2-in 1 LED Bulb Launched, Priced at Php399! 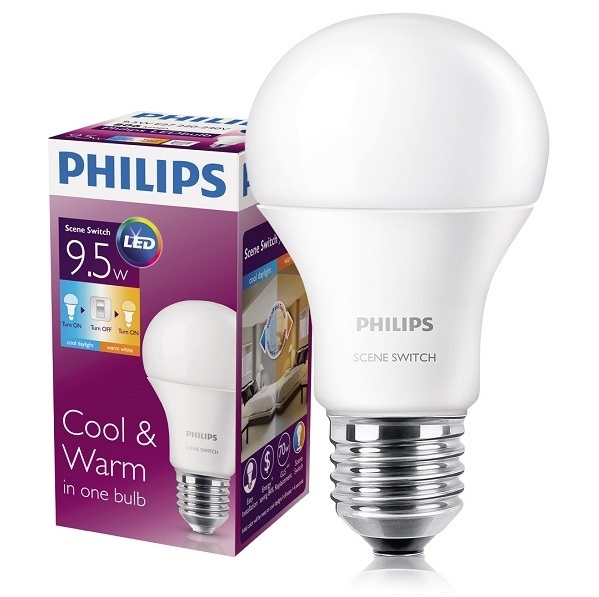 Royal Philips has just introduced its new Philips Scene Switch LED bulbs for the home. A new lighting product innovation for 2015, the 2-in-1 LED bulb allows homeowners to enjoy the benefits of warm white light and cool daylight in a single light bulb with just a flick of a regular switch, with no re-wiring, retrofitting or extra accessories needed. For many homeowners, both warm white (yellow) light and cool daylight (white) light are important for different tasks. This is not surprising as many homeowners conduct a variety of activities within the same space at home, and hence the need for both task lighting for productive work as well as ambient lighting for specific occasions. With the introduction of the Philips Scene Switch LED bulb, homeowners now have the option of varying the light colors in a room to suit their needs at different times. For example, someone who works from home can kick-start their day with cool daylight, which helps in concentration, and switch to warm white light in the evening when it is time to relax and unwind or when hosting guests at home, to create a cozy and inviting ambiance that is perfect for entertaining. “Consumers today focus on personalization when it comes to the design of their homes and lighting is very much part of this process. Homeowners no longer look for a light bulb just to illuminate their home; lighting also needs to fit the type of activities they perform in a particular space. We found that in many households, having multiple lights, such as table lamps and night stands can clutter up the space and use more energy too.The new Philips Scene Switch LED bulbs are specially designed to give customers the option to illuminate their homes with warm white light and cool daylight, using one single light bulb. This will change the home experience and provide people with the best of both worlds,” said Christine Villanueva, Country Marketing Manager of Philips Lighting. The Philips Scene Switch LED bulb has a simple mechanism to toggle between warm white light and cool daylight. The bulb’s default setting is cool daylight. To change it to warm white light, users simply switch the light off and on again. To change it back to cool daylight, switch the light off and on. The light will be reset to the default cool daylight if there is a pause of more than five seconds when the switch is turned off. Philips Scene Switch LED light bulb fits into existing sockets and fixtures, which allows hassle-free installation. The bulb does not require re-wiring, retrofitting or extra accessories. Homeowners can simply install the light and enjoy two light color variations in one LED bulb. Philips Scene Switch LED bulbs use up to 84% less energy than incandescent bulbs and last up to 15 years, giving greater energy savings in the long run. The bulbs contain no hazardous materials, making them safe for use at home. The LED bulb comes in one size and consumes only 9 watts for a brightness level of 806 lumens. Philips Scene Switch LED bulbs will be available at major hardware stores, starting September at only Php399.